Jack in the hot shop. Jack Baker was inspired to try the art of glassblowing by an exhibition of Dale Chihuly’s work at the Akron Art Museum in 1998 and a trip to the artist's studio in Seattle. He honed his craft at Steinert Glass School in Kent, Ohio where he collaborated with the area’s best craftsmen. His love of glass soon expanded into a business with the opening of Akron Glass Works in 2006. 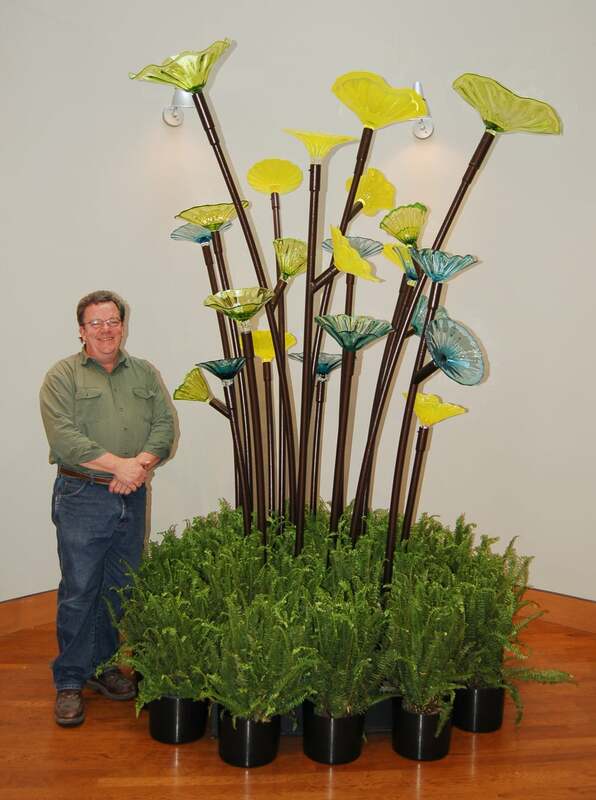 Jack likes his work big, bright and colorful and is most inspired when combining his glass with tropical plant installations. He has a fantastic team of hot shop collaborators. Jack is also the owner of Architectural Greenery, Inc. (at the same location as AGW) and has been in the interior plantscaping business for over 35 years. He graduated form Ohio State in horticulture and has serviced commercial and residential clients in the Akron, Canton, and Cleveland areas as well as provided foliage and florals for the WGC Bridgestone Invitational golf tournament at Firestone Country Club.